Slow down! Crafting sentences in your head might help you get them right on the page. 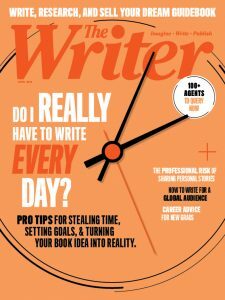 In the February issue of The Writer, contributor Jack Hamann shared tips from author and former New York Times columnist Verlyn Klinkenborg. Klinkenborg’s advice was like nothing I’d ever heard before: Don’t take notes. Don’t outline. Compose each sentence in your head before you commit it to paper. Accept no draft sentences. 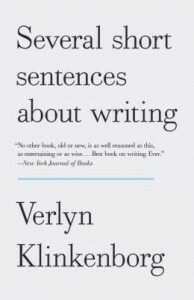 “Most of the sentences you make will need to be killed. The rest will need to be fixed,” Klinkenborg writes in his book Several Short Sentences about Writing. Klinkenborg’s method sounded like the exact opposite of my own, which is: Take 10 pages of notes (even though you may only use one). Do not write until you have a clear outline in hand. Get the words on paper, then go back and revise them. And I’d always thought that flow – that magic time when the words come effortlessly – was a good thing. Not so, Klinkenborg says. When the writing comes easily, it’s usually because we’re resorting to clichés. “A cliché is dead matter. It causes gangrene in the prose around it, and sooner or later it eats your brain,” warns Klinkenborg. No one wants to be told one’s writing may be eating one’s brain. I decided to give Klinkenborg’s method a shot. I wrote a short, 400-word piece about a woman who would not shake my hand at my father’s funeral. I did not outline. I did not put a single sentence on paper until I was happy with it in my head. When the words started to flow easily, I put the brakes on and reconsidered my sentence structure. Sometimes – when the words were pouring out of me and I was so desperate to get them on paper – I wanted nothing more to abandon the Klinkenborg method and just get the words out. But I kept at it. In the end, I never got the emotional release I usually get from writing something personal, because I was focusing so hard on the craft instead of letting the words flow. But my piece was technically sound. It was unique. It was focused. And by slowing down and avoiding my own personal clichés, I learned a lot about how I write as a whole. Want to try it in your own writing? Give the “Klinkenborg method” a shot by following these steps. Pick a topic that you can write about in 500 words or less. Don’t create an outline. Sit down at your computer, but don’t touch anything. Slow down when the words start to flow. Pick and choose your words with utmost care. When you’ve reached the end, reflect: How is this piece of writing different from other things you’ve written? Did you discover any personal cliches you often reach for in your writing? What did you learn about your writing style as a whole? And finally: Is Klinkenborg’s method for you? I agree with Just_Banlas. Just because somebody writes a book about how he works doesn’t make it gospel. In my own writing, I still opt for getting it all down – good, bad, and/or ugly – stream-of-consciousness style – in order to capture the mood or atmosphere best for my story. Then I spend considerable time editing, polishing, finding words better suited to it. Why stifle creativity with the sledgehammer of craft? Where’s the heart and passion of such a story?